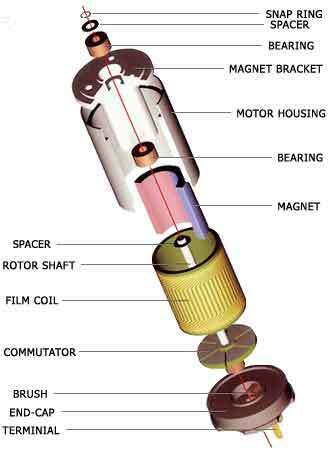 In a conventional servo, the motor has a steel core armature wrapped in wire that spins inside the magnets. In a coreless design, the armature uses a thin wire mesh that forms a cup that spins around the outside of the magnet eliminating the heavy steel core. A coreless motor does not have magnets as standard servo motors do, so they have a smoother, more constant, and stronger action. Regular servo motors have either 3 or 5 magnets (poles) which when the armature is between these, the servo motor is at its weakest. I’d like to amplify a little. Using a coreless motor in a servo doesn’t guarantee the servo is superior; likewise, using a 3-pole motor in a servo doesn’t mean the servo is inferior. However, coreless motors are more expensive than poled motors and coreless motors do lend themselves, or are better suited, for precision applications. Therefore, while it is possible to have a high precision, high torque, high speed servo that uses a 3-pole motor, odds are the manufacturer will select a coreless motor instead. The flip side; because of high coreless motor costs, the manufacturer won’t bother selecting a coreless motor unless they are designing a precise servo. In the real world, what this means is that if a servo is listed with a coreless motor, odds are strongly in favor of that servo being very precise and smooth. Likewise, if a servo is listed as using a 3-pole motor, odds are the servo wasn’t designed for precision. Cored electric motors are incredibly common; you’ll see this design concept every time you turn around if yore looking. Auto starters, power tools, RC car motors and lots more… The heavy rotating mass [core] of these electric motors known as an armature is comprised of metal plates [poles] sandwiched around a metal shaft, the metal shaft is supported at both ends by bearings, and each pole is wrapped with copper wire [windings]. More poles, equals more windings which in turn creates smoother less notchy operation. The armature spins at high rpm encompassed by a permanent hollow center magnet which is located within and lines the inside diameter of the metal can (thus the term CAN motor). Power is introduced to the windings, which in turn creates an electro-magnetic field. This field is opposed by the magnet which in turn causes the armature to rotate. Coreless motors operate within the same design concepts, but are assembled in a different manner. The coreless armature is lightweight and the windings are formed into a cylindrical shape [no metal plates or poles, typically a wire mesh screen]. The armature is fixed to a metal shaft at one extreme and the armature is supported at one end [imagine a hole saw with an arbor attached]. The armature rotates around the outside diameter of a permanent hollow center magnet within a space between the inside diameter of the metal can. Coreless motors respond faster to the electro-magnetic field due to their light-weight. The coreless armatures accelerate and decelerate much faster and smoother resulting in less overshoot of the commanded position, cause and effect is more precession. Additionally more force is generated with like amounts of power, on a side by side comparison to a cored armature with a smaller diameter. The larger diameter coreless armature emulates a longer lever or arm when pushing the motor shaft, this equates to a higher torque rating. The lack of poles opposed by electro-motive force [EMF] allows the coreless armature to center more accurately while maintaining or holding position with increased authority [there is no space between poles, thus more positions to rest at]. Analog and digital servos share the same internal components less the servo amplifier [the device which commands the servos position]. Analog amplifiers interpret RX command and pulse power [on/off] to the armature at say 50 cycles per second, the space in between the on/off cycles is known as dead-band [db]. No power is consumed at idle. Power is delivered at full available voltage. The potentiometer [pot] feeds position info to the amplifier. If a signal is received from the RX or the servo arm is deflected the amplifier pulses power to either move too or resist the opposing force. The amplifier compares position to commands and reacts to the need by alternating the duration of the pulse to speed up or slow down the servo motor, thus moving too or holding the commanded position. Digital amplifiers via the micro-processor interpret RX commands or signals and operate within fixed parameters; the preset commands together with commanded position are then delivered to the servo motor. Center, end points and maximum speed are preset parameters. The duration of the power pulse and the amount of power utilized to activate the servo motor varies dependent on the need. Servo performance is greatly enhanced with this method of motor control. Digital amp’s also send power pulses to the servo motor at 300 cycles per second much more frequent than the analog amp [power is consumed at idle]. Known result [servo buzzing]… The increased pulse cycles command the servo motor to react and perform with more precision simply because of the increased pulse frequency or interval. Net results are faster response to control command signals, lower dead-band numbers, increased holding power and much better resolution. Programmable Digital amplifiers, in addition to the aforementioned digital amplifier operating description have a programmable memory which can be altered via a programmer. The servo operation parameters therefore can be manipulated within programmable parameters to the user’s individual needs. Center and end-point positions, speed, dead-band, rotation, failsafe and more are programmable.